Former ambassador M K Bhadrakumar retired from the Indian Foreign Service in 2002, and since then has emerged as a strong, informed and often critical voice on India's foreign policy. His interviews and writings have provided an alternate voice in the public discourse, particularly as regards United States policy in the Middle East and more recently in the Afghanistan-Pakistan region. The thrust of Bhadrakumar's foreign policy theory is that India, while pursuing a strategic relationship with America, should equally focus on strong ties with Russia, China and Iran. He spoke to rediff.com's Sheela Bhatt. 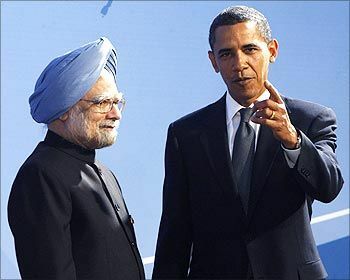 A week before Prime Minister Manmohan Singh's visit to the United States, President Barack Obama travelled in the region. Iran's Foreign Minister Manouchehr Mottaki has arrived in New Delhi. Australian Prime Minister Kevin Rudd, and a high level team from Russia, have just concluded their respective visits to India. What is the trend emerging from this flurry of diplomatic missions? It is gratifying to note that Indian diplomacy is actively diversifying the country's external relations. By the way, you forgot to note the intensity of the high-level visits from Delhi to Moscow -- one presidential visit, two prime ministerial visits, and visits by the Indian foreign minister and defense minister. Isn't that a lot of traffic between any two countries in a six-month period? This is what most serious regional powers are doing at a time of such great volatility in the international system -- invigorating old partnerships, probing new ones. Look at Turkey or Brazil. It is difficult to tell whether Turkey is closer to NATO or to Russia. Brazil is getting ready for a path-breaking visit by the Iranian President. This is a period of adjustment and multi-vector diplomacy. India does not face any 'unipolar predicament'. India needs to prepare for the historic shifts taking place -- Asia's surge, America's decline, new regionalism, etc. India has always regarded Iran as a factor of regional stability. In the period since the US invasion of Iraq in 2003 especially, Iran's regional stature and influence has enhanced. Australia is a newfound strategic partner in the Asia-Pacific region. There is no question that India -- like Russia or China or Brazil -- attaches high importance to the relationship with the United States. It is in India's interests to foster excellent ties with the US as a source of technology, investment and trade. An influential Indian Diaspora lives in North America. In sectors like education or agriculture, we benefit out of America's cooperation. Image: US President Barack Obama with Prime Minister Manmohan Singh. How do you see Dr Singh's 'Mission America'? Is India missing George W Bush? The prime minister's visit is very important as an occasion for taking stock of the entire range of bilateral issues. There is no doubt that India-US relationship has transformed; the surge was so rapid that it bred illusions. Now, a period of adjustment is already under way. Remember that the two countries held over 50 military exercises during the past five-year period. The frenetic pace looks baffling. The US lacks conceptual clarity about India's standing in the region. We were told not too long ago that we were numero uno in the region. Of course, that was a false impression created by the previous US administration in terms of their interests at that time. The regional security situation is acute -- but are the concerns of India and the US identical, and do they invariably converge? Obviously, the Obama administration has promised 'change' in US policies. The US faces grave domestic problems on multiple fronts, which will be its priority. Also, the global economic crisis brought out that the US is a declining power. And despite being the pre-eminent military power, the US has lost two wars in this decade. Clearly, the US needs the cooperation of the world community to tackle a host of problems, be it North Korea or climate change. Again, the truth is that the US can do nothing to prevent China's ascent, while at the same time the two are inseparably linked in terms of the future of their economies and the fragile global economy neither quite adversaries nor partners. Obama's visit earlier this month to China underscores that from Washington's part, too, there is a compulsion to recalibrate its single most important relationship. Adjustment is needed in the India-US relationship. Therefore, we need not look for dramatic breakthroughs during the forthcoming India-US exchange. As regards the Bush era, it is irrational to attribute the vicissitudes of state-to-state relations to individuals at the helm of affairs. A nation's interests ultimately prevail; objective factors, historical forces prevail. Delhi knows it, and the rest is grandstanding. 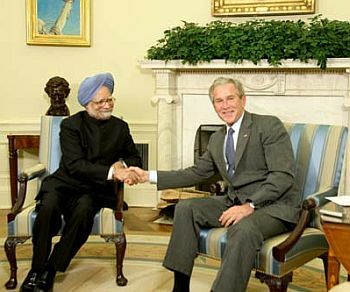 Image: Then US President George W Bush with Prime Minister Manmohan Singh at the White House. Do you think India can offer anything more than what it is doing now in Afghanistan? How do you see India's role in view of the emerging US policy in Afghanistan? This is an important question in the agenda of the talks in Washington and it merits careful analysis. India-Afghanistan bilateral ties are as warm as they ever could be. With [Afghanistan President] Hamid Karzai's re-election, Delhi can look forward to a further period of fruitful cooperation. Therefore, India must build on the current level of bilateral cooperation, which has been almost entirely in the nature of Afghan economic reconstruction. India must now aspire to play an active role in the 'Afghanisation' process that lies ahead, and which is integral to stabilising that country. Short of military deployment in Afghanistan, which in any case militates against the Indian thinking, India should do all within its capabilities. 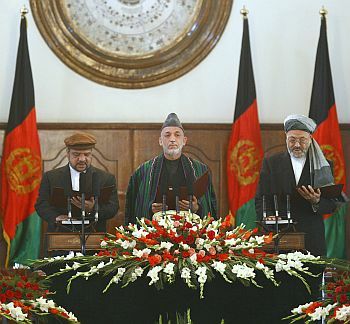 The 'Afghan-ness' of the new government is very visible and the country is inching towards regaining its sovereignty. It is an excellent decision that Foreign Minister S M Krishna represented India at Karzai's inauguration. India's positive attitude towards the Iranian suggestion of joining a regional format is a major development. The format, which currently includes Iran, Pakistan and Afghanistan, may in the near future also bring in China and the Central Asian states. If that happens, a regional initiative becomes possible. The prime minister's likely visit to Tehran in February has the makings of a landmark event. The Indian policy will do well to factor in that the US concerns in Afghanistan are similar in some respects as ours, but are sharply diverging in certain other respects. India has a relationship with the Afghan people which is historical, cultural and profoundly political and frankly, India does not need America as a go-between. Two, India's interests are best served in cooperating with the other regional powers that include Iran, China and the Central Asian states -- and possibly even Russia. Three, India should be careful not to suffer collateral damage from flawed US policies. The US insulated the 'homeland' and other Western countries from terrorist violence, but the eight-year war has been a disaster for the stability and security of our region. Pakistan has been seriously destabilised and there has been negative fallout on Iran, India, China and the Central Asian states. As for the 'emerging' US policy towards Afghanistan, let us wait and see to what extent it is 'new'. The eight-year US policy to co-opt Pakistani military as its principal regional partner has proved to be a road to nowhere, as the two sides pursue contrary objectives and constantly indulge in dissimulation. It appears Washington is in a chastened mood today, but it cannot easily extricate itself from Pakistani military either. The war began as a sort of revenge on the perpetrators of the September 2001 attacks on the US but it is quintessentially a Clausewitsean war that is laden with the hidden agenda of dominating Middle Asia. Will the US jettison its hidden agenda? We are yet to see definite signs. On the contrary, Obama's visit to China shows that the US remains wedded to striking 'grand bargains' bilaterally with regional countries, while retaining the monopoly of conflict resolution in Afghanistan. Such a strategy perpetuates the US dependence on the Pakistani military. Again, it is only the Pakistani military and the ISI that can deliver the Taliban to the negotiating table. Therefore, Washington's new strategy can only work with the cabal of states comprising the US, Britain, Saudi Arabia and Pakistan as its fulcrum. It is not a question of Obama's sincerity. The Pakistani military will be extremely averse to Obama's 'exit strategy'. The military-to-military and intelligence-to-intelligence links between the folks in Rawalpindi and Washington are almost where they were in the halcyon days of the Afghan jihad in the 1980s. In view of the fact that ENR (Enrichment and Reprocessing) technologies are not yet given to India, would you say the US-India civilian nuclear cooperation agreement is at risk of failing? As far as I know, backchannels are at work. But an agreement may prove elusive, as the Obama administration has a pronounced outlook on revamping the nuclear non-proliferation architecture, and our nuclear deal needs to be situated within that architecture. Second, the negotiations over the Iran nuclear issue are at a most sensitive stage. Iran is a thorny issue for Obama, and an agreement with India on ENR and reprocessing technologies has deep implications. At any rate, our nuclear deal has been a strategic overreach -- it raised expectations on both sides which will not stand the test of time. It was shrouded in vacuous political rhetoric that was bound to wither away. It was predicated on assumptions regarding alignments in world politics that were patently unrealistic. There shouldn't have been such a rushed enterprise. India certainly needs a far more accountable and transparent mechanism of policymaking. Do you think the spirit behind July 18, 2005 Indo-US agreements has waned? Now, is it time for a reality check? Read the corpus of literature available here on India's strategic thinking dating to that period in 2005 and after. You'll turn red in the face. It is embarrassing in its sheer naivet and intellectual shallowness. The Indian foreign policy establishment touched a nadir during this period, and a quaint 19th century worldview of 'balance of forces', that the world discarded a long time ago, warped Indian thinking. The policy makers should never have attempted to place India within a quadripartite alliance directed against China. The change of leadership in Japan and Australia eventually got Delhi off the hook, but the delicate equilibrium in India-China normalisation was disturbed. Surely, some stocktaking is needed why such aberrations in strategic thinking occur at all. Most serious countries embarked upon perestroika in their foreign policy in tune with the rapidly changing world situation, but India somehow held on to outmoded notions. A kind of cockiness set in. Serving Indian diplomats actually wrote that the US and India were on a joint proselytizing mission as democracies to usher China in as a 'responsible member' of the contemporary world order. Yes, a reality check is in order and probably it has begun. The great danger will be to imagine that the stark reality facing India is a mere matter of the political personality and the beliefs and the audacity of hope of Barack Obama. Are you optimistic about Prime Minister Singh's visit to Washington? The best outcome of the visit will be that the India-US relationship, which blossomed so dramatically in the past decade, undergoes a period of maturing. The visiting Iranian Foreign Minister Mottaki said in an informal conversation two days ago that his mission primarily aimed at 'modernising' Iran-India relations, and that Tehran was opening a 'new page'. A similar approach is needed with regard to the India-US relationship. The signs are encouraging. We are just a week away from the prime minister's visit, and yet the television channels are still full of Sachin Tendulkar. I am absolutely impressed that we scheduled Mottaki's visit during this week. The prime minister's visit holds out the promise of a realistic and sustainable partnership between India and the US. 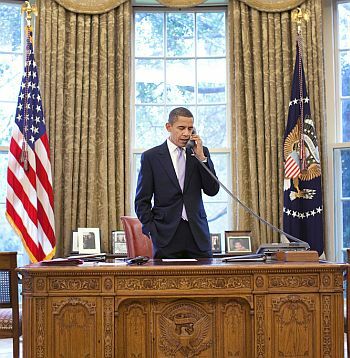 Image: President Obama in the Oval Office. It is argued that in the coming decade the China factor will dominate the Indo-US relationship. Do you agree? I hope not. China is the biggest challenge facing India's diplomacy today, and Delhi needs to work single-mindedly to build on the process of maturing and deepening of ties under way in recent years. The US focuses on China as its most important bilateral relationship. The US realises that China has the power to spoil its global agenda. The US is incapable of 'containing' China or of being prescriptive about the way the Chinese people should live. The US needs a more collegiate China. The message ringing in the world chancelleries as Obama winds his way back to Washington is that China has risen already. Therefore, getting mixed up with the US on China's rise is a bad idea. In any case, we have reservations about the US strategy to have a 'grand bargain' with China on the problems of stability and security over South Asia. India doesn't need mentors. Our differences with Pakistan are best resolved bilaterally. Nor should we overlook the US policy of cherry picking. A true strategic partnership must be based on great sensitivity towards each other's core concerns and vital interests. I don't see that happening in the India-US relationship. Therefore, we will be placing ourselves at a disadvantage by allowing the India-China relationship to become another 'boutique issue' on the US' global agenda. To what extent do you think the Tibet issue, especially the Dalai Lama's recent visit by to Arunachal Pradesh gives a dimension to the US-India partnership? Frankly, I am unable to comprehend what good purpose was served by the Dalai Lama's visit. We have a consistent position with regard to Arunachal Pradesh and China has its position, and the two sides are well aware of each other's position. The crucial thing is that notwithstanding the differences in the two countries' respective positions, they are agreed on maintaining peace and tranquility on the borders. It is not in India's interests to unnecessarily raise dust in relations with its neighbor, and this recent visit did generate a controversy. A need arises for India to coolly assess what it gained and what it may have lost. It is for the government to undertake an honest exercise and come to the proper conclusions while advancing the impetus of India-China normalization. All countries introspect. India need not be cynical like America to honor the Dalai Lama with a Congressional medal one day and then refuse to receive him. However, the relationship with China needs to be handled from a long-term perspective, and irresponsible and, alas, ill-informed opinion-making has done harm. Do you think there would be more pressure on India to have a dialogue with Pakistan, and that Af-Pak Special Envoy Richard Holbrooke will eventually succeed in putting Kashmir on the table? New Delhi does not need to be told by anyone about the importance of a continuing dialogue with Pakistan. The prime minister made India's intentions clear during his recent visit to Jammu and Kashmir. The question is whether a climate conducive to meaningful dialogue exists today. India has consistently rejected the scope of outside mediation, and I am surprised that India-Pakistan relations figured at all in the joint statement issued after Obama's visit to Beijing. Of course, Beijing will have the wisdom to know that it hardly pays to be the doormat of US regional policies. A fascinating conversation took place between our then foreign minister Dinesh Singh and his Chinese counterpart Qian Qichen in Tehran almost 16 years ago. The Chinese statesman told us that Kashmir is a backlog of history and is a purely bilateral problem for India and Pakistan to resolve, which is possible at a future date when the requisite mutual trust and confidence is available in the overall bilateral relationship. As a functionary in South Block heading the Pakistan division at that time, I thought of how the Chinese position accorded with the spirit of the Simla Agreement. In comparison, the American position on Kashmir has never been helpful or transparent, and it is driven by geopolitical considerations. Besides, the US has an appalling record as a mediator look for instance at the Palestinian problem. The US 'pressure' boomeranged in Kabul, though Afghanistan is a weak country. The protagonists, who fancied themselves as viceroys, were summarily shown the door by the Afghan side. I am sure the Obama administration realizes the limits of its capacity to 'pressure' other countries -- least of all, India. 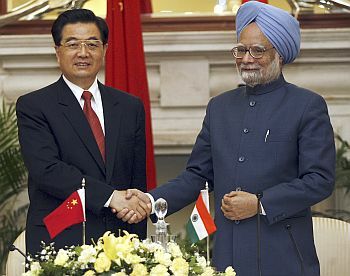 Image: Prime Minister Manmohan Singh greets China's President Hu Jintao.